Hey Helmet. | Heathcliff, For Why? We have another update to the Heathcliff Helmet Canon: the HEY helmet. I have many things to say about this. Why is he wearing the helmet in this scenario? Heathcliff normally wears a helmet when he’s about to attack something. This helmet seems inconsistent with his agenda of socializing with people at the party. Also, who are these people at the party? The Nutmegs don’t seem to have that many young friends. And why is grandpa a waiter at his own party? 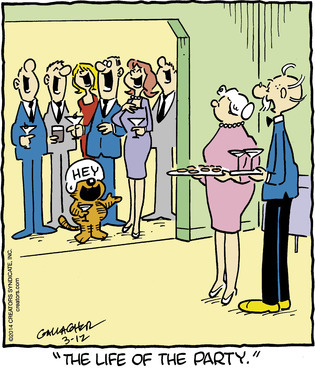 Pat, a friend of mine, pointed out that Heathcliff probably just told a racist joke. He’s probably not wrong. Also: are there any non-white people in Westfinster? This entry was tagged crazy people, grandma. grandpa, heathcliff, helmets, jokes, parties, racism, westfinster. Bookmark the permalink. Pingback: Newest Additions To The Helmet Canon. | Heathcliff, For Why?